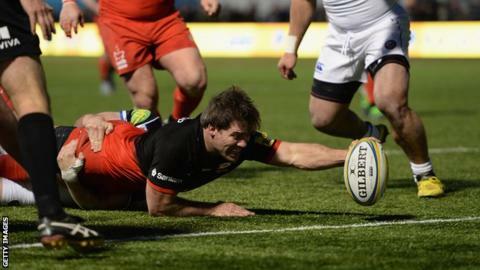 Premiership leaders Saracens came from 13-0 down at half-time to record a fine win over struggling Bath. Tom Homer's converted try and two Rhys Priestland penalties put the Blue, Black and Whites ahead. Bath withstood severe pressure after the break, but their defence finally buckled when Schalk Brits crossed with 10 minutes left. Hodgson then added two late penalties to secure victory for Sarries, their biggest league comeback in history. Victory stretched Saracens' lead at the top of the table to seven points, with second-placed Exeter travelling to Worcester on Sunday. Defeat was tough on Mike Ford's side, who produced a superb defensive display after the interval, at one stage spending almost 10 minutes camped inside their own 22 yet surviving unscathed. But Bath - beaten by Saracens in the Premiership final only eight months ago - could not avoid a sixth league defeat in nine matches. Since lifting the trophy at Twickenham, Mark McCall's men have been in imperious form, winning their opening eight Premiership games in 2015-16 before losing to Harlequins on their most recent league outing on 9 January. Trailing 13-6 after 70 minutes, Saracens drew level when Brits wriggled over after an eye-catching break from England hopeful Maro Itoje. Hodgson, who had kicked two penalties before converting Brits' score, landed two more three-pointers in the final seven minutes to seal victory. "If Maro keeps on playing like that, I'm sure he'll get an opportunity [with England]. I thought he was really good in the second half; every carry made a difference. "We were very composed at half-time - Brad Barritt led the team magnificently. "We didn't think we played too badly in the first half. We just needed to pressurise them, use the wind and improve our set-piece. "Once we got in front I thought we were magnificent. We had 15 minutes of almost perfect rugby." "I'm proud of the first half, proud of the performance. The boys got stuck in. "There's 13 league games left for us; there's another two before we reach halfway. We have to accumulate to get to the top four and we're going to go for it. "Saracens conceded six penalties from mauls and didn't get anyone in the sin bin, not even a talking-to. "[Richard] Wigglesworth kicks it dead from the halfway line, it's our scrum feed and the referee rules that it's us to be penalised on our own ball and we're under pressure again. "It's small margins and you need that rub of the green with the referee." Saracens: Ransom; Taylor, Bosch, Barritt (capt), Wyles; Hodgson, Wigglesworth; Barrington, Brits, Du Plessis, Itoje, Hamilton, Rhodes, Burger, Wray. Replacements: Saunders, Thompson-Stringer, Lamositele, Smith, Brown, Spencer, Mordt, Tompkins. Bath: Homer; Rokoduguni, Banahan, Bowden, Agulla; Priestland, Cook; Auterac, Webber, Thomas, Ewels, Day, Garvey, Louw (capt), Houston. Replacements: Dunn, Lahiff, Wilson, Ellis, Mercer, Faosiliva, Evans, Clark.